I can think of few things that unravel a championship fantasy team like an injury. We all have to weigh the injury factor on draft day when we're staring down the Clinton Portis decision. Or the Donovan McNabb decision. 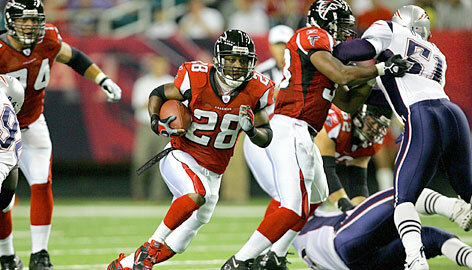 Or the Warrick Dunn decision [photo: Streeter Lecka, Getty Images]. Or the Kevin Jones decision (the list goes on...). You've got to be a hawk when it comes to injuries - so for some assistance turn to SI's The Hurting. On another note, I've found an interesting disparity between those who are picking up another RB in the 2nd round versus those who are going with a WR in the second round. Gregg Rosenthal makes a good case for picking up a WR in his blog, Pancake Blocks. However in 2007 Wide Receiver Profiles, ProFantasySports.com is convincing in their argument that this year there is great depth at the WR position and missing out on an RB2 to get one of the few top WRs could be more damaging in the long run. To me, so much of it depends on your draft position and competition of course. Check out that PFS.com WR article for a nice synopsis on basically all WRs you'd ever even consider drafting. I've read your post "The Injury Hawk & The Round 2 Selection Debate". Found some informative info.